There�s an old adage in mountain towns that says �People come to visit for the winters, and they stay for the summers.� This town may just have perfected that concept, and when people buy real estate in Park City or Deer Valley, the summers tend to be the bonus they didn�t expect. The Park City community literally explodes with activity, and wide variety of activities, in summer � recreational, cultural performances, special events � and it�s a wonderful time for families to build memories, couples to enjoy time together in perfect weather, and each of us to enjoy the expanse, (and sometimes even the solitude) of the great American West. Park City has an astounding number of trails which you can enjoy on your own or with the added comfort of a guide. Mountain Trails Foundation produces a trail map every year (they have to because new trails are always being added) and you can pick one up at numerous locations around town. There are also a couple guide books for the trails around town, and one (Prime Cuts 2) even has a guide to the wild flowers in the area. If you aren�t familiar with the trails, and you�d like to make sure you get back in time for dinner, White Pine Touring and others offer professional guides that can take you places you probably wouldn�t go on your own. 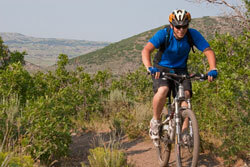 Park City has more than 400 miles of mountain biking and hiking trails in and around town. Two of the rides have been designated by the International Mountain Biking Association as �Epic Rides,� and Park City is the only town in the world to have more than one. Park City is a mountain biker�s candy land with trails for every single level of rider from paved bike paths by meandering streams to national caliber downhill race courses. While Park City ranks among the top three places in the country for mountain biking, the road biking in Park City, and in fact all around the Wasatch, more than holds its own as well. The Tour de Utah, one of the toughest road biking races in the country, has stopped in Park City for the last several years bringing with it some of the top riders in the world, including many straight from the Tour de France. Road riding here isn�t just about racing, however. There are rolling bucolic rides all around Park City. Utah's excellent fly fishing streams and rivers have recently begun to receive the notice they deserve. Some of the best include rivers close to Park City: the Provo, the Weber, Strawberry Reservoir and the Strawberry River east of Heber, and the hundreds of streams in the Uinta Mountains to the east. There are significant equipment and supply offerings from local sports stores, and a large number of experienced guides: fishing is a genuine strong offering here. Park City's area golf courses are famous for their scenery, conditions, and variety, and in some cases, great challenge. Exceptional local public courses include Park City�s own municipal course, and four nearby Utah State Park courses which are extremely popular, even played often by private golf club members. The two courses of Wasatch State Park, and the Soldier Hollow courses (at the site of the 2002 Olympic Nordic events) are among the favorites in the state. In addition, the three nearest private courses enjoy the top three rankings of courses in Utah, prospective residents who enjoy golf will want to review current real estate offerings in those communities. Little-known insider knowledge: there are three large reservoirs close to Park City. In particular, the newest, the Jordanelle Reservoir, has been developed as a water-sports center. The reservoir is specifically divided into three sections which separate wakeless sports, protected swimming beaches, to full-power water amusement. There is a State Park located at the Jordanelle, which offers, supplies, picnic tables and grills, and dozens of campsites. Inland at Park City doesn�t mean away from swimming and water sports! Over the past few years, equestrian events have broadened and grown in the area. There are several indoor arenas, which provide newly established eastern traditional events, such as dressage. As one would expect, the existing Western-saddle trail rides are steadily popular --offerings abound both within the resorts and in the region. Utah Olympic Park was a competition venue for the 2002 Olympic Winter Games for Nordic jumping and the sliding sports of bobsleigh, luge and skeleton. The nearly 400-acre Park features a mixture of sporting facilities and visitor areas for an incredible Olympic experience. You can ride on guided and controlled (but still scary!) summer sleds on the winter tracks. There are frequent demonstration performances � the center is a training facility all summer � of ski jumping and aerials. The park has also recently installed zip-line and other rides.